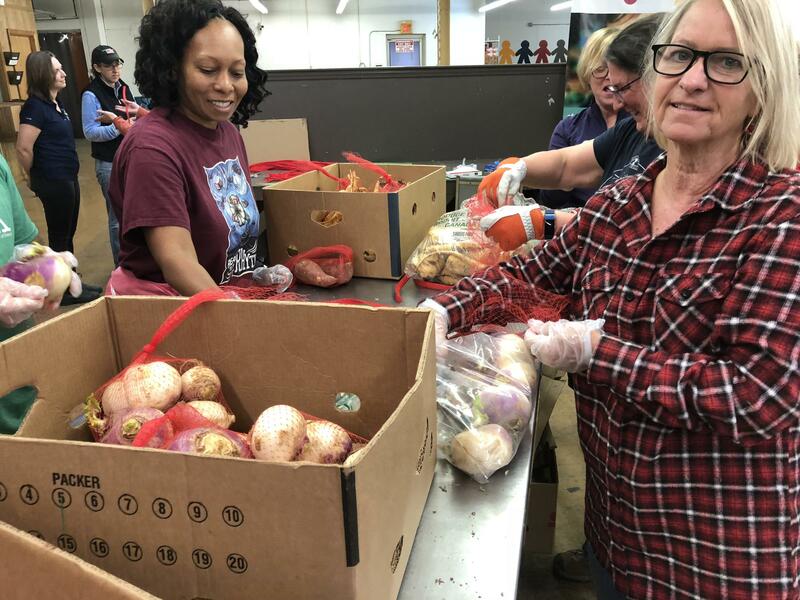 EPA employees Tiffany Purifoy, left, and Janice Godfrey, right, volunteer at Food Bank of Eastern and Central NC in Durham during the government shutdown. One day, out-of-work EPA workers did light housework at the Ronald McDonald House. Another day, they wrapped bundles of diapers at the Diaper Bank or volunteered at the Food Bank of Eastern and Central North Carolina. “The Food Bank has told us these are going to children who don’t have enough over the weekend," said longtime EPA employee Alison Davis. Davis has worked for the EPA 19 years, with most of that time in Research Triangle Park. For now, she’s bagging soup, fruit cups and cereal. Davis and many of her co-workers remember the 2013 government shut down, when they also volunteered. Brett Gantt was hired to work for the EPA one month before the 2013 shutdown. “I think a lot of us are a little bit nervous about what the future is going to hold and how long it’s going to last, because a lot of people can’t weather a very long shutdown," said Gantt. Tiffany Purifoy has worked for the EPA the past four years. She says the first thing she did after being furloughed was pay all of her bills. Then she decided to give back. “I usually do the donations because of the busy life that I live, but to finally have the time to do the hands on part is really fulfilling,” said Purifoy. Just over 7,000 workers across North Carolina are affected by the government shutdown. But many of them are not able to volunteer. For example, TSA workers at Raleigh Durham International Airport and officers at the Butner Federal Correctional Complex have to report to work, but don’t get paid. Blood tests of New Hanover County residents showed no GenX, but they did reveal several newly-identified perfluorinated compounds. On Tuesday officials held a public meeting in New Hanover County to explain the test results. North Carolina's two Republican senators say they oppose President Donald Trump's pick to oversee chemical safety at the Environmental Protection Agency, putting Michael L. Dourson's nomination at serious risk.